It is no secret that I’m a dog person. Just look around my flickr album and you’ll see that my dog, Fatso, had his own page of pictures. Yes, I love dogs. I'm pretty ignorant when it comes to cats and the way they behave. It's not that I disliked cats. I actually like pretty much all animals but dogs are so loyal and loving. And then there's all that tail-wagging and obvious, unconditional affection. Dogs are full of so much love. It's all they want to give. I love dogs and miss mine (Fatso) dearly. It is simply torture to feel a presence in a room and to look around, only to find nothing, and know that my one constant is gone forever. My lovey, though, is a cat person. A life long cat person. He loves cats, he loves their independence, their fierce displays of affection, their kneading and their purring and the way they weave about your legs when they really like you (or when they're trying to get food). He does not even mind if his clothing or furniture were always covered with a fine layer of fur. He even have a mug that says "My Cat Runs My Life" referring to Neko the cat, the other woman in his life now! Neko is a beautiful 6 years old female Tabby. She almost always gets her way and meowing sweetly and lots of purring are her best secret weapons! Neko also has a thing about water in the tub. She watches it and drinks it right from the tap instead of her drinking bowl. I don't understand her attracting for running water. I mean, she gets fresh water in her bowl next to her foods. 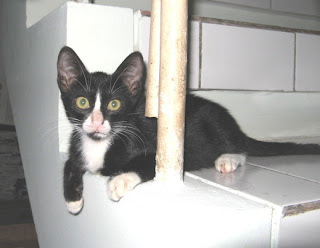 Anyway, two weeks ago my house helper brought a stray kitten home which I named "Suneo" after the famous Japanese manga series, "Doraemon". Hokenawa Suneo is actually my least favorite character in that movie series but the kitten looked so thin and has a very almond shape face just like Suneo. In the movie, Suneo, is seen as a narcissist who loves to stare at himself in the mirror while telling himself that he is the most handsome guy in the world. He is still a bed-wetter and needs to wear diapers when he sleeps, despite being in the fourth grade. He considers this as his secret weakness, and according to his mother, it is his only weakness. 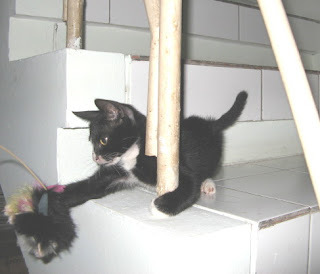 Meanwhile, Suneo the kitten, is a loud whiner when he first came to the house. We just did not know what does he want and it took him several days to adjust to his new place. Even though he is only a little kitten, he meows loudly and long in creative ways to get his will done. And he has a great vocal range. Really, it looks like he loves to hear the sound of his voice when he wants some attention! He will sleep just about anywhere , and stack of catalogues are his favorite spot... ...I think Suneo just wants to show us that he can grow up as a book worm!!! He also has a fun thing about boxes. He just loves to jump in so he can crouch low and paw at them and then jump out to chase his toys. Everyday he finds something new to play with from under the catalogue shelves. He surely surprises me with a lot of his antics. My lovey teased me that I have now become a cat person. Well, in my heart there will always be a special spot for Fatso and that won't change. I think caring about animals is the good bottom line, regardless of their differences. 1. Whenever I create passwords for my emails, ATM pin number and other things that require passwords, it is more likely I will use the part numbers from certain products from the catalogue books as it's locked away in the vault of my mind. 2. I am not a big fan of jewelry but I like seeing other people wearing them. My ears were pierced when I was a baby and I wore earrings when I was a little girl but they never lasted long because I always took them off. Necklaces, bracelets, rings are okay but only if I can take them off after that. Dont ask me to wear them 24/7. 3. I love chillis sauce on almost anything I eat except cakes...lol! I like them on my soup, as a dipping for the fried chicken / fish. I like them for the pizzas, sandwiches or burgers. I just love anything that has 3 flavours ... salty, spicy and sour. Now I have to cut my hot meter because the herbalist told me it is not good for my endo problem. 4. I get stuck on certain foods/fruits for a period of time. Once it was spicy veggies salads / star fruits / strawberries for a couple of weeks. Once it was spicy froglegs soup / sweet martabak, until I got sick of seeing them... hehehe! Right now it's granny apples and pineapples. 5. When I go to the cinema, I always chose to sit near the exit door because I'm afraid of fire or anything bad that might happen. 6. My prefered choice when buying clothes or T-shirts are white, black, pastel colors (pink, light blue, light yellow). Although I like bright colors like red, yellow and green but I hardly have this 3 colors in my wardrobe. 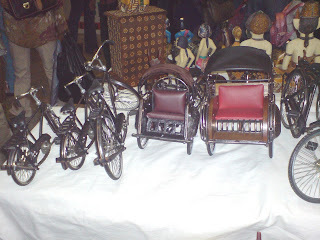 The following pics were taken in April when I went to see Inacraft Expo in Jakarta. 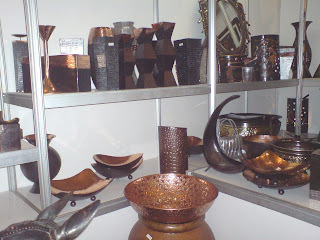 Inacraft is the annual Indonesian craft trade show that offers large variety and quality handicraft products. My biggest hobby (actually my weakness) when visiting an event like this was I could not resist the temptation to shop! I am so addicted to shopping Indo crafts. Right now I have plenty of beautiful hand woven bed covers, wall decorations, table runners, cushion covers, batik paintings etc. Well, I have this obsession to open my own handicraft website on e-Bay! Here are some of the snapshots taken with my Sony Ericsson cellphone camera . Enjoy! Dear readers, I really have been insanely busy these past few weeks and have somewhat forgot that I had a blog! Well, I bet you all thought I got bored of blogging, but that is not the case. What's happened firstly, I had a bad cough for more than 2 months after the flood and it caused me a lot of discomfort and money as I had to visit the doctor 3 times and they gave me different medications and none of them worked! The doctor asked me for a chest and throat X-ray but everything looked fine. I was then given some antibiotic for a week, plus the cough meds but my body reacted badly which cause me had nausea, vomitting and sleep disorder. The problem visiting doctors in develop country like Indonesia is that you have to pay for every visit and I mean you pay for the consultation fee (for telling them what went wrong with you), the administration fee, if you are ordered to have an X-ray that will be another extra cost, then the meds needs to be paid as well. Falling ill can drain your wallet here. Because the meds did not seem to give any improvement, I decided to let nature takes its course and ate more fruits and avoiding foods that would trigger the coughs such as chillis, fried foods, dairy products, etc. I don't have any clue to what caused this severe cough. Was it an infection or something that my body absorbed post the week long flood in Jakarta??? During my trip to Canada, my coughs got better probably because the air quality there is cleaner and fresher and I have had less stress. I also tried the OTC cough syrup from Buckley's which tasted awful but worked for me. Another reason for not blogging so long was our office moved which just caused so much work. We got it all done and now have to get stuck into doing some work on re-organizing the files, stocks, etc. Anyway, that is what is going on with me. Hope everything is going well with you all.